If you read my column in today's Boston Herald, you'll soon find that I'm all over the place. Why? Because, while writing it, I opened my almanac and wrote about whatever was on the page I landed upon. Open an almanac to anything and I'll enjoy something on that page. I love almanacs. 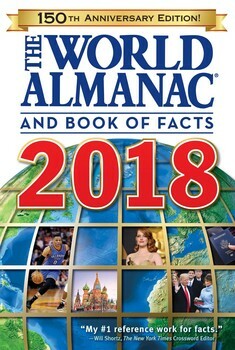 For my birthday a couple of weeks ago, MY WIFE bought me the World Almanac for 2018. I have been engrossed in it ever since. I sit in the room where I smoke and read about such things as average mean temperatures, gross domestic products, all-time leaders in passing yardage, and top-selling fiction of 1965. The book is 1007 pages and crammed with fuel for my thought mill. ... and I thank you in advance for going there and reading. I read half of your column but then music started and a man's voice started trying to get me to buy something so I zapped him, so I don't know what the end of your column said but I'm sure it was inspiring, more inspiring that that man that I had to get rid of. I hate being interrupted like that. Oh my gosh, I am buying an almanac! Almanacs are fun, and they put the possibility of serendipity back into our lives. An online search that directs you to their ads and then the information you want leaves very little possibility of discovering things by serendipity, and some fear that serendipity is dying out among us because of it. I loves me some almanac. . . I mean, where else are you gonna find out the national motto of Rwanda, or how Beaverhead County, Montana voted in the last presidential election? And just for the sake of saying so, I've actually held a $500 bill in my hands. . .